Lurking in the shadows, quietly advancing the industry—that’s where the independent control programmers have set up shop. They don’t buy anything; they don’t sell much, just their services, which 20 years ago, when they first began to dot the scene, wasn’t really a thing yet. In many ways, they’ve been on the bleeding edge of the industry while demonstrating a savvy perspective on the industry’s evolution. 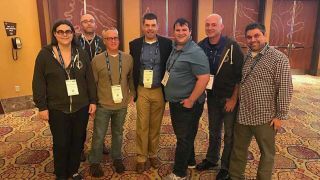 Take it from Steve Greenblatt, president and founder of Control Concepts, who is celebrating 20 years as an independent programmer. Recently, he took some time out of his day building and leading a team of programmers to reflect on the business changes he’s enjoyed a (shadowy) front row seat to. Looking back two decades ago, the concept of outsourcing control system programming was far from a mainstream practice, and business primarily came from the control companies themselves. “As demand grew, people started to look toward the idea that there are people out there that specialize in programming, and you don’t have to keep everything in house or train your own personnel to do it,” Greenblatt recounted. “It became more of a lucrative business and the concept was more widely accepted.” Integrators followed suit, satisfying their project needs, and relationships were formed. As systems complexity has grown—gone are the days of simple systems, and even the single room systems are mostly too—programmers have expanded their service offerings. Control Concepts has dabbled in graphics and interface design, and field support is another area of opportunity, along with engineering services, manufacturer modules, and audio DSP programming. That complexity has extended to the job of a programmer in general. While they used to have to search for information they didn’t know without relying on the internet, “Now we have to know a lot more about the devices,” Greenblatt noted. As someone who has spent 20 years adapting to the latest trends, Greenblatt has a unique vantage from which to peer into the future. The days of being open-source or open-standards in AV control are coming into view, as everything continues to become less hardware related. The once-isolated nature of the business has retreated, and there’s even an element of mainstreaming. The network is much less of a mystical, metaphysical association.